We recently caught up with Pete Beckwith '92 for a Q&A. Though reluctant to join Delta Tau Delta at first, Pete flourished as a member of the fraternity and savored every minute. Today, looking around at the amazing accomplishments of the brothers in his pledge class and other Miami Delts, he couldn't be prouder to be among such an outstanding group. Q: Why did you join Delta Tau Delta as an undergrad? How does your membership continue to impact your life today? A: During rush, I really liked the actives. In fact, I went into rush rejecting the Delts. As a legacy, I didn't want anyone to ever think I got into DTD because my dad and grandfather were Delts, so I said to myself, “I'll stop in so I can tell my dad I hate these guys.” But I remember meeting them the first night and being really impressed. There was really no comparison between the guys I met at 220 Tallawanda vs. any of the other houses I rushed. As rush went on, I really wanted to be a Delt. 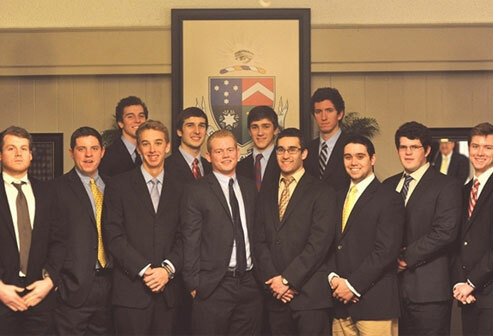 I'm so proud to see so many brothers from my pledge class do so many life-changing things. The accomplishments of my fraternity brothers really says something about what a special group of guys the Delts at Miami University are, and the fact that we were selected to be part of this amazing community, regardless of what curves life has thrown us, says something pretty special about each of us. Q: What was your DTD experience like? A: I really enjoyed rush. I enjoyed meeting the actives, and I was really impressed by them: their personalities and stories were terrific. Then came pledging, and in those days it was a little rough and it turned me off. I never appreciated the rationale that after being shunned for 3 months, we were supposed to come out of that experience respecting the upperclassmen. I understood it, but just will never appreciate it, but at the same time, I was really proud to be a Delt. I enjoyed competing in Greek Week and getting cheered on by my brothers at Fraternity Fight Night (my first and last boxing event). I enjoyed racing and doing well. And meeting all the fantastic people. I developed relationships with guys that were tighter than I knew at the time. Q: What did you do after graduating in terms of your career? Are there any specific achievements you’d like to share? A: I went to Miami and studied manufacturing engineering. As I got closer to graduation, I was becoming less enamored with the idea of working in a factory, but I loved problem solving. A fraternity brother of mine, Scott Mitchell '92, suggested I check out a company called Arthur Andersen. I joined their middle-market business consulting group and gained great experience in problem solving, project management, and leadership. Unfortunately, after an accounting scandal at Enron, Andersen went out of business and I got a terrific a job working for one of my clients: Cardinal Health. It was a great experience. At Cardinal Health, I had the opportunity to learn a lot about the healthcare industry and to see many areas of running a business. I had lead roles in marketing, IT, warehouse operations, Lean Six Sigma deployment, and merger integration. After 12 years at Cardinal Health, I reconnected with a few of my Andersen colleagues, and we decided to start our own business consulting company. So far, things have been great. We've remained busy and are continuing to grow. It's been a fantastic experience. Q: How do you feel your DTD years prepared you for your future, personally and/or professionally? A: DTD helped me understand the importance of engaging. I know its cliché, but you really get out of something what you put in. And looking back, I probably didn't engage as well as I could have, but when I did engage with DTD, I got a lot out of those experiences. I think DTD helped me better discern and develop better relationships in my life. In my professional career, working with others is so important and seeing others that were like me interacting in the shelter has helped me build my life and career. I learned some important lessons while at Miami and have a lot of memories that still make me laugh. It helped give me confidence in the things I do today because of the successes I enjoyed at DTD. Q: Are you still in touch with other brothers? If so, how often do you see them and where do you meet up? A: Not often enough, but LinkedIn is amazing. After about 15 years, I had the opportunity to grab dinner with some guys that I have, and will always, enjoy. And with each one, it was as if we had never fallen out of touch. We had so much to share and be happy about. I met up with Paul Ryan when he was running for VP, and he greeted me at the fence line with a big hug "Pete!" as he introduced me to his secret service detail. To think he was in my pledge class, along with Dave Sabgir '92 who has started the renowned, national program “Walk with a Doc,” and Dave Landever '92 who has done amazing things standing up for patient welfare in his law practice, and Dorsey Wisotzki '92 who after I ran into him in the Atlanta Airport, I glanced at his business card and realized he’s a Navy SEAL…so amazing! I'm so proud to see so many brothers from my pledge class do so many life-changing things. The accomplishments of my fraternity brothers really says something about what a special group of guys the Delts at Miami University are, and the fact that we were selected to be part of this amazing community, regardless of what curves life has thrown us, says something pretty special about each of us. A: Like many parents, we're at the age where we're preoccupied with our kids and thinking about the future. We have two daughters, and our oldest just got her driver's license and received a scholarship to Pitt for gymnastics. So things are moving fast for us. I'm still running, although a lot less than I used to—and less than I'd like to. Q: What advice can you share for fellow alumni and undergrads? A: First and foremost, be engaging. I've learned that the ability to connect with people is critical to success. CEOs decide very quickly if they like you, so treat a job interview like rush. Be excited about the opportunity. Be charismatic. Be engaging. Secondly, help people solve their problems. Once they view you as someone who is fun to work with and who gets things done, you will be rewarded with more responsibility—and more responsibility generally means more compensation. Compensation alone won't make you happy, but it's easier to turn it down than it is to ask for it.